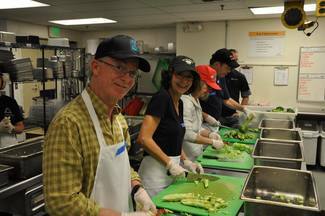 Help our chef instructors and students with kitchen prep for the Community Meal Kitchen (800-1000 meals). Lunch is included. No experience required! You will learn more than you thought possible about cutting and preparing food for countless recipes! Note: Wear long pants, closed toe shoes and a baseball cap or hairnet. No clothing with drug or alcohol markings. Street parking north of Lenora for $1.50/hour or east of 8th. Go through the door that says "administration." Call the number on the door that says, "after hours volunteers." I would like to carpool if possible.